On November 14, 1927, at a meeting in Akron, Ohio, the Executive Committee of the Rubber Division, ACS, requested top rubber industry technical people in New York, Akron, Boston, and Los Angeles to organize local sections. Ray Stringfield, Chief Chemist at the Los Angeles plant for Goodyear Tire & Rubber Company was given the assignment for this area. He enlisted the aid of Emmet Long of Long Turney Corporation, and an organizational meeting was held on January 20, 1928, at Mary Louise Cafe with 43 attending. The group organized as “The Los Angeles Rubber Group of the Rubber Division of the American Chemical Society.” Ray Stringfield was named as the first Chairman. TLARGI meetings were held irregularly until 1936 when regular meetings were scheduled. Around this time, membership badges were issued. On February 1, 1938, the first sponsored meeting was held. Goodyear was the sponsor and 123 people attended. In November of 1935 the first door prizes were presented courtesy of Ed Royal of H.M. Royal. Donated prizes were offered for several years, and eventually the present ticket raffle was instituted. It was not until 1956 that the Prize Committee solicited prize money to be used for the Christmas Party and Summer Conference. The first venture occurred in 1934 when Ray Stringfield taught a course in “Rubber Technology” at the University of Southern California (USC). It was repeated in 1936 and irregularly after that. In 1949 a continuing program was set up by the Technical Committee. In 1943, the group incorporated as “The Los Angeles Rubber Group, Inc.” and in November of that year named Ed Royal as their first Honorary Life Member. The lifetime-member insignia was also adopted that year. The first Rules and Procedures appeared in 1946. TLARGI members undertook one of their most ambitious projects in 1948 when they sponsored a special summer meeting of the Rubber Division, ACS. It was the first ever for Los Angeles. 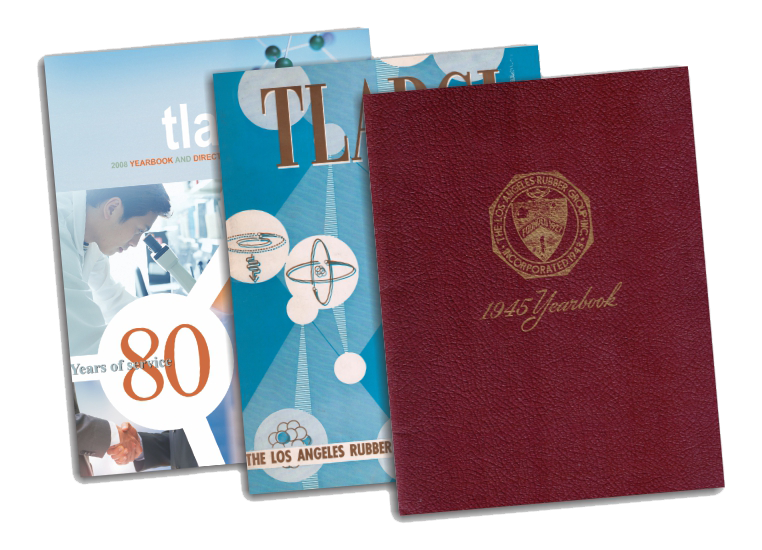 By 1951, the treasury had reached $10,000, of which $5,000 was used to set up what was to be the TLARGI Foundation at USC. At the same time, the Solicitation Committee was instituted to obtain additional funds from the area rubber manufacturers. The year 1955 saw the forerunner of the Fall Conference when the Golf Committee set up a weekend tournament at the Thunderbird in Palm Springs. Over 50 golfers and wives participated. The first Technical Conference was held in 1960 under the chairmanship of Deke Maddy. TLARGI membership has remained fairly constant over the years. Geneva (Schminke) Wells became the first female member of TLARGI in 1973. Margaret O’Donnell became the first woman chairperson in 1988. The rubber industry in California has carved out a specialized niche serving the industries of transportation, building and construction, aerospace, defense, medical and electronics. TLARGI plays an important role in supporting these industries. Meeting attendance is up and the social activities continue to be well attended. The Yearbook & Directory and TLARGI News are better than ever, the Memorial Scholarship and Undergraduate Scholarship programs are progressing well, and the Basic Rubber Technology Course is making a valuable contribution to the industry. TLARGI is the most active rubber group in the country and vows to remain that way.